At A Harmony Nail Spa we believe the health of your natural nails is important, and we take steps to preserve the health and beauty of your natural nails. 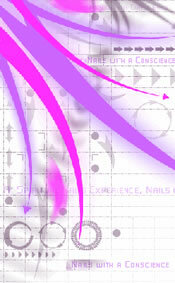 We use the finest professional powders and liquids by Creative Nail Design and OPI. These are safe products no MMA, they are also considered "smart" products, they are designed to break away from the natural nail with sufficient force as not to damage the natural nail, unlike older acrylic products or non professional lines. We practice safe drilling methods, with electric files, used for manicures and lightly buffing the surface of the nail to prepare it for your enhancement service. We also adhere to national guidelines of safety and sanitation, any of our staff can educate you on these practices. All drill bits, service areas and files are sanitized using an EPA approved sanitize, if an implement comes into contact with blood we are required to sterilize the implement for yours and our safety. We offer a full line of acrylic enhancements to add beauty and length to your natural nail such as, natural tips, crystal clear, colored tips, french tips, as well as designer tips. We guarantee all nail services, no lifting guarantee or repaired for free, per two week period after your service. If there is an ongoing problem with your enhancements your technician may recommend a different service, for your lifestyle and personal nail care needs. To enhance your experience, our specialty enhancements include full set silk wraps, gel nails, and gel fill.